Present in trace amounts in all living organisms. Many therapeutic effects (antifungal, antihypertensive, anticarcinogen). Could prevent liver diseases and regulate immunity. 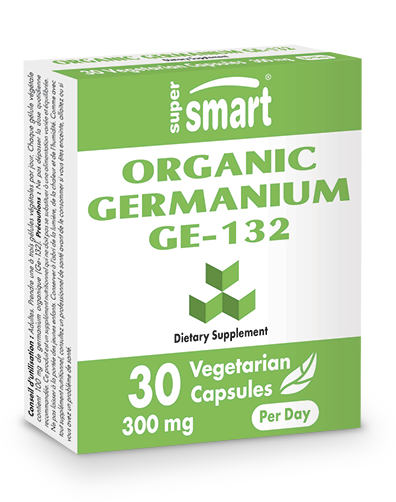 Organic germanium, also called Ge-132, is a trace element found naturally in certain plants such as ginseng, shiitake, garlic and chlorella. Organic germanium has been widely studied, and scientists believe it offers a number of therapeutic effects: antifungal, antihypertensive and anticarcinogenic. The use of this trace element may also prevent liver disease and regulate immunity. it participates in the natural production of interferons, a group of proteins involved in immune response. Current scientific thinking is that organic germanium stimulates the body’s natural defences. Organic germanium has been extensively studied by Dr. Kuzihiko Asai in Japan, who founded the Asai Institute to develop its therapeutic use in the form of dietary supplements. His studies on dosage showed positive effects at doses of between 100mg and 300mg a day. Containing 100mg of organic germanium, our product is also safe, with rapid absorption and elimination. Each vegetarian capsule contains 100 mg organic germanium (Ge-132). Take 1-3 capsules a day, or more, as advised by your therapist.